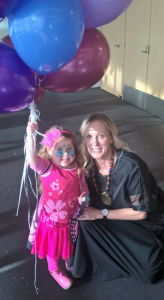 Little Ms R and I recently went along to the Sydney launch of the children’s book, Zary Little Wisdoms. 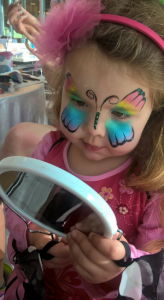 It was a magical affair, with a book reading, book signings, fairy face-painting and a very zen atmosphere… No surprise given author Kay Andrews’ background is in energetic and spiritual healing! Zary is a spirit warrior full of wisdom. Her mission is to share her wisdom via a series of positive quotes, like: “Take a deep breath and enjoy now” and “When you are a good friend, you will always have lots of friends”. The book aims to teach children how to feel confident within themselves, and better deal with any sad or negative feelings. It was actually while Kay was studying for her energetic healing diploma that she realised many issues in adults stem from their childhood. She created Zary to promote self love, inner strength and happiness amongst children. Her hope is that by building emotional resilience in kids she can help them avoid issues later in life. I love the illustrations: Zary is depicted as a spunky, rock chick style of fairy, the kind of fairy I always wanted to be when I was little girl. She is also at one with nature, illustrated with a mix of butterflies, unicorns and dolphins. I think girls of all ages will be enchanted by the imagery. It was lovely to meet Kay Andrews and chat to her about Zary. The idea for the book had been in her heart for about four years and it is lovely to see her come to life in the new book. 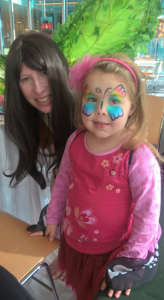 She signed a copy of Ms. R, but I think my daughter was more captivated by her rainbow butterfly reflection! She is a little young to appreciate the messages, but Zary Little Wisdoms is a book she can grow into and we can talk about as she grows up.